Cats need high protein, high fat diets for optimal nutrition. Although fat cats may look cute, experts warn that feline obesity is nothing to laugh about. An overweight kitty may experience serious health consequences of overindulging. Indoor cats may eat out of pure boredom. 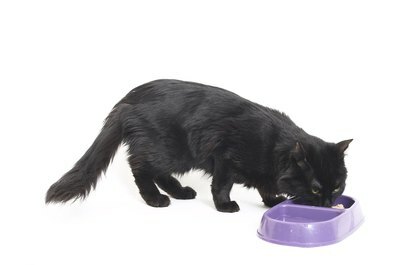 Cat foods designed for weight loss can put your kitty on the path to health and happiness. Carbohydrates don't mix with kitties who need to lose a bit of weight. Cats are natural carnivores and in the wild, they derive most of their calories from raw protein. Many cats convert carbs to fat rather than use up the calories from carbs as energy. Choosing a weight loss food with very little carbohydrates will assist Kitty in losing weight and maintaining the new weight. As a rule of thumb, your cat's diet should contain eight percent of carbohydrates. If your kitty is significantly overweight, it might be a good idea to search for a wet canned food designed for weight loss. Cats need fatty acids in their diet, such as Omega 3 fatty acids. These are common in fish, such as salmon. Fatty acids deliver nutrients their body needs while simultaneously helping them feel "full." Wet food for weight loss should be high in protein, high in fat, and low in carbs. Keep in mind that it's not about cutting out fat for Kitty's weight loss. Cats need to stay on their usual feeding schedule, as skipping only one meal can put them at risk for fatty liver disease, which is build-up of fat in the liver. This can happen when a cat stops eating and their liver takes fat from other areas of the body, attempting to convert the fat into nutrients. If your cat loves their dry food and turns their nose up when presented with a wet food designed for weight loss, working closely with your veterinarian to acclimate Kitty to her new diet is necessary. Knowing what to look for on the labels of cat food is important in selecting a high quality food for Kitty. The first few ingredients should contain a type of meat not processed from animal parts that are not suitable for human consumption. This type of meat doesn't contain the high-quality nutrients that your cat needs in order to lose weight and be healthy. Feed your cat the recommended amount on the package. Setting out a bowl of food at all times is not recommended even if the food is specifically designed for weight loss. Kitty could still be getting more calories than she needs when there is an all-you-can-eat buffet available to her around the clock. "Vomiting, Diarrhea and Weight Loss in Elderly Cats"